Hello stampers! 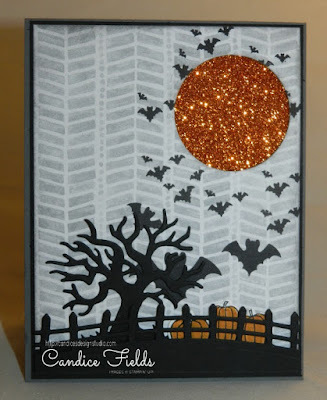 Today's card is featuring the Spooky Fun bundle. This bundle features the Spooky Fun and Halloween Scares stamp sets and the Halloween Scenes Edgelits Dies. I decided to create a scene card. I just love the Halloween Scenes Edgelit dies. I am in love with the fence and spooky tree. The Pumpkin Pie Glimmer Paper made the perfect moon. I created an array of bats flying away with the Halloween Scares set.